Beginning at birth, I teach my children to play independently throughout certain parts of their day. As a very young infant (birth to age 6 months) this basically looks like placing my babies on their play mat and having them play there independently for 10-15 minutes once or twice a day. Once they are sitting independently and rolling, Independent Playtime moves to their pack n play. I place 3-4 toys in the pack n play and they play there independently for 20-30 minutes once a day. At this time, I begin setting a timer at every Independent Playtime. This teaches baby that I come back when the timer goes off. Certain children that have resisted the Independent Playtime at this age soon learn fussing won’t end their playtime – the timer does! They quickly learn to play happily in their pack n play until the timer goes off. Once my children turn 1 year old, my goal is to have their Independent Playtime increase to 30 minutes. At age one, their Independent Playtime still happens in their pack n play. I rotate toys they play with during Independent Playtime to keep things fresh and interesting for them. Sometime between 18-24 months, Independent Playtime moves to their bedroom (or the playroom)* and the time is increased to 45-60 minutes once a day. I slowly increase their Independent Playtime by adding a few minutes here and there to the timer until I reach my goal of 45-60 minutes by age two. *Before Independent Playtime is moved to their bedroom/playroom, I make sure their bedroom/playroom is 100% baby-proofed. All baby meds, ointments, etc. are removed from the room. Dressers and any other furniture that could fall on a child are bolted to the wall or removed from the room. Baby monitor wires are placed out of reach of little hands. 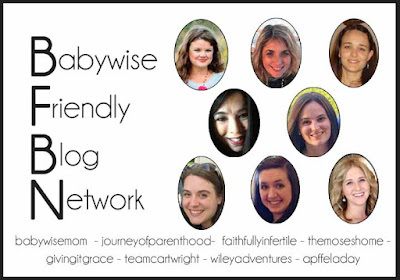 When I learned about Babywise, I learned about Independent Playtime too. At the time, I had no way of knowing how beneficial teaching my children this skill was going to be 5-6 years later when we began homeschooling! Currently, I have a 6 year old in 1st grade, a 4 year old in preschool and a just-turned 1 year old. Our home is hopping with excitement, energy and, yes, chaos at times. I must confess that over the past year, for various reasons, our family had gotten away from a consistent Independent Playtime for each child on a daily basis. As we began our new school year, I was attempting to teach my 1st grader phonics and math with her 4 year old sister constantly interrupting and needing my attention. It was frustrating and at the end of school time, I felt like my head was spinning and no real teaching had been accomplished. Then, one day, it dawned on me. Independent Playtime! That very day, I re-implemented Independent Playtime with my 4 year old, and, just like that, I was able to 100% focus on math and phonics with my 1st grader. My 1 year old was already doing Independent Playtime but I moved his Independent Playtime to the first 30 minutes of our school day. We do Classical Conversations and the first 30 minutes of our school consists of Memory Work review. A 1 year old in the middle of all that was complete chaos. With a tweak of his Independent Playtime, he is now safely and happily playing in his pack n play while I review Memory Work with the girls. 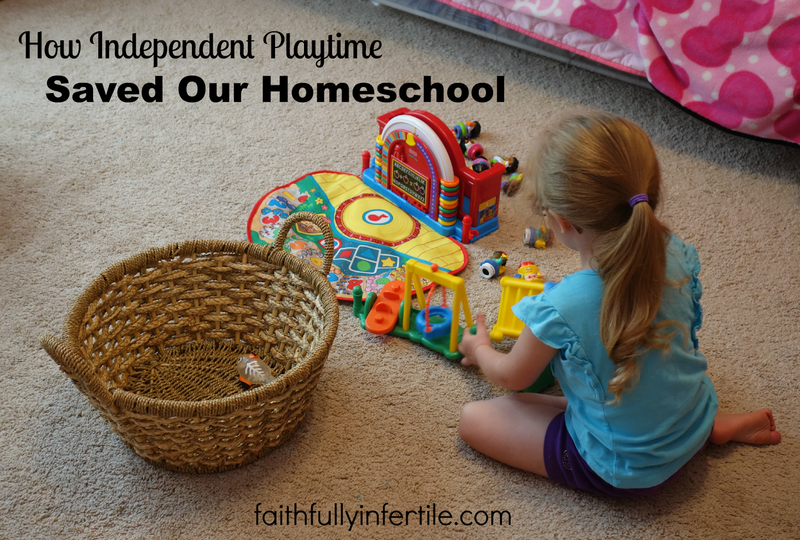 Homeschooling with a 6 year old, 4 year old and 1 year old in the mix is going to have its times of craziness, but implementing Independent Playtime back into our schedule has drastically reduced the chaos that was our homeschool at the beginning of this school year. 10 Minutes: I take 10 minutes to Read Aloud to my girls. 4yo leaves her Independent Playtime to join us and then goes right back to playing once the chapter is over. 30 Minutes: Math lesson with 6yo while 4yo is doing Independent Playtime and 1yo is napping. In the early elementary years (K-2nd grade), instructional time is kept to the basics of reading, handwriting and math. This means I need only 1.5-2 hours daily to teach. With Independent Playtime (and naptime for the baby!) scheduled in for the little ones, this leaves me plenty of time to be able to fit in all the academics for my older child while the little ones are doing their Independent Playtime! But I’ve NEVER done Independent Playtime! Is it too late to start? If you are reading this and you have never established an Independent Playtime for your baby, toddler or child, it is not too late to start implementing this today. Valerie has many posts about Independent Playtime that you can read here. 1. Decide the location (pack n play, bedroom, playroom) dependent on your child’s age. 2. Choose a set of toys that your child can only play with at Independent Playtime. Rotate toys every couple of weeks to keep things new and exciting. 3. If your child is under 12 months old, place them in the pack n play with 3-4 toys and tell them to have fun playing and Mommy will be back when the timer goes off. Set the timer for 5 minutes. (More if you think your baby can handle more.) As soon as the timer goes off, return to your baby and say, “Playtime is over! Let’s clean up your toys.” After a couple days of 5 minutes, increase the time on the timer until you eventually reach your goal of 20-30 minutes. If your child is old enough to have Independent Playtime in their bedroom or playroom, explain to them the rules. (You get to play in your room with these special toys until the timer goes off. Stay in your room until the timer goes off. You can leave one time to use the potty, if needed.) If your child is not old enough to understand the boundary of staying in the room, you can close the door or put up a baby gate. I prefer to use a baby gate so I can monitor what is going on in there during playtime. Set the timer for 5 minutes (or more if your child is older and not resistant to the idea of Independent Playtime). Increase the amount of time over several days/weeks until you get to 45-60 minutes. When the timer goes off, immediately return to your child and have them clean up their toys. 4. If you are met with a lot of crying and resistance to Independent Playtime at first, do not be discouraged. With consistency, your child will learn to play happily until the timer goes off. I did not start implementing Independent Playtime until my oldest was 14 months old. There was LOTS of crying at first. It wasn’t long and she learned to play on her own, happily, until the timer went off. Independent Playtime teaches children invaluable skills whether you homeschool or not! They learn to play creatively and they increase their attention spans. Independent Playtime benefits all members of the family. In this stage of my parenting, it is saving my homeschool, giving me the one-on-one time I need to teach my children without constant distractions and interruptions from their siblings. Elaine is a homeschooling mom to 3 and blogs at faithfullyinfertile.com.